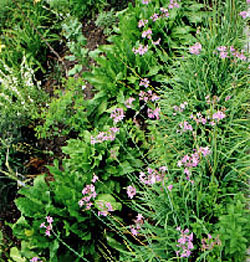 The clumps of narrow, dark green leaves are topped by numerous clusters of lovely pinkish purple, star-shaped flowers onn tall stiff stems. It is a wonderful plant to grow in containers. Ornamental and edible. Categories: all potted plants, culinary herbs, Potted Plants, More..